We have officially reached the halfway mark in our school year, and it is an excellent time to reflect on the progress we’ve made so far. I hope that you have seen development in your young ones since we started down this path in September. Here at Hand-In-Hand, we have witnessed social skills develop through coming together as a group, as well as through creating new friendships. 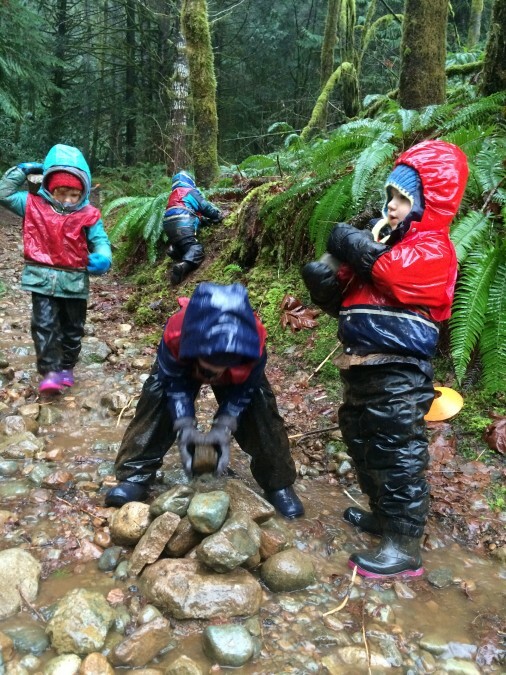 We have seen physical literacy improve by navigating challenging terrain in sometimes challenging conditions. 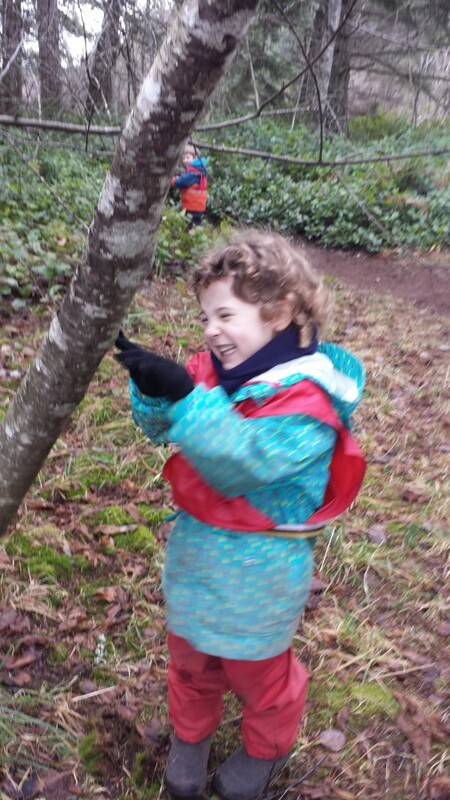 We have seen children develop respect for each other, the environment and themselves, and watched as they have taken their self-care more and more into their own hands. Pre-reading and maths skills have been developing too, just by observing what happens around us, as well as through books and activities. This and so much more – it has been a busy 5 months!! Thank you for sharing your children with us! As the seasons shift, so do we. The changes in the Roots group are pronounced now as we make the best of wintry conditions. 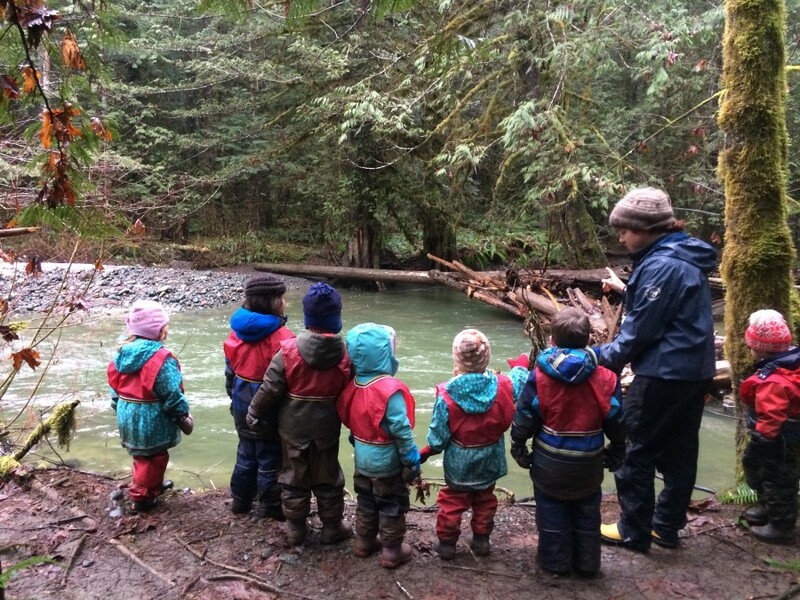 There is no end to what we can discover at any time of year, and the change in how the children see the land and ask questions about their surroundings have become deeper and more meaningful. What will their aptitude for learning do when spring comes around and life peeps around every corner? 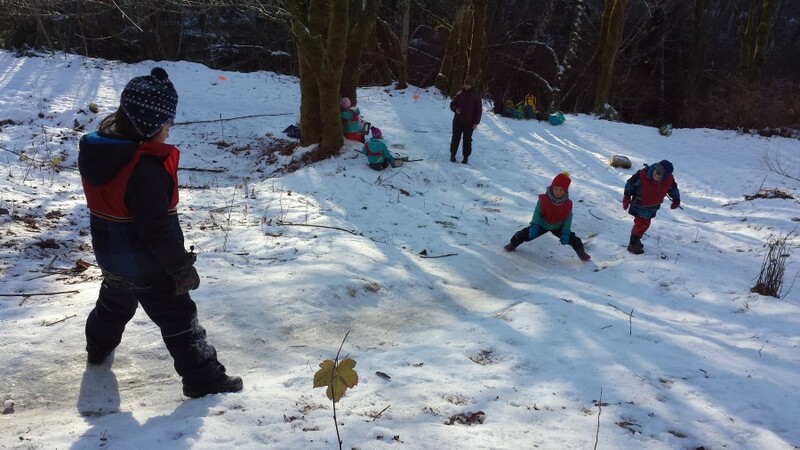 Friendship, teamwork, empathy and creative problem solving are some of the social skills they’ve developed, through the daily tasks they set out to accomplish and through group dynamics that uniquely arise in outdoor settings.Group decision making, voting and consensus are skills practised and understood too. I am so excited to see where we go from here! 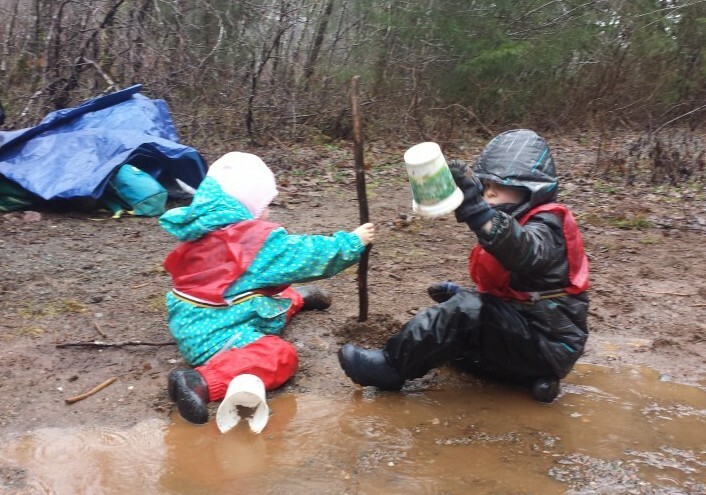 2016 started off as a cold, white, winter wonderland, but by the end of January we saw the world thaw, water levels rise, and mud return to our classrooms. During the first week of January we had fluffy, fresh snow! 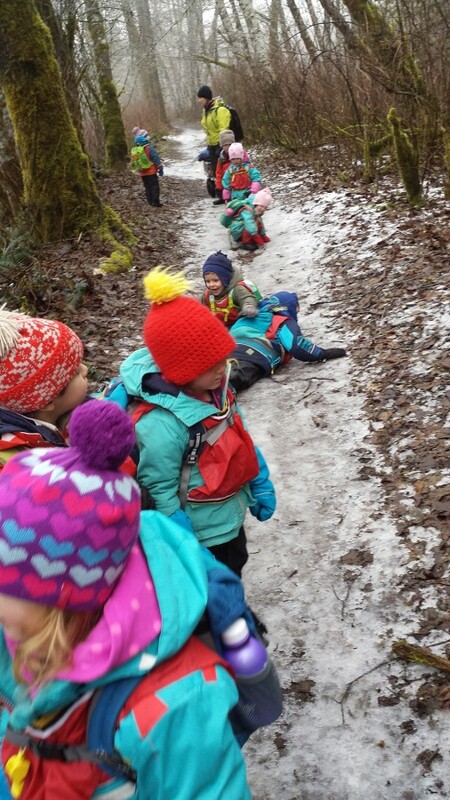 By the second week, the ground was icy, and it was too dangerous to visit classrooms with steep hills! 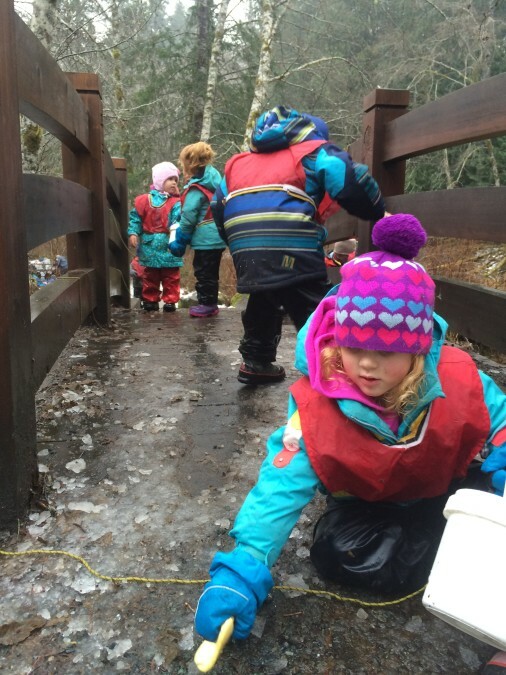 By the end of the month, all the snow/ice had melted and we welcomed water and mud back to our forest! All the rain and melted ice dramatically increased the water flowing through the forest! Here we visited the log jam, which in October was completely dry. In fact, this is the first time we had seen water here! 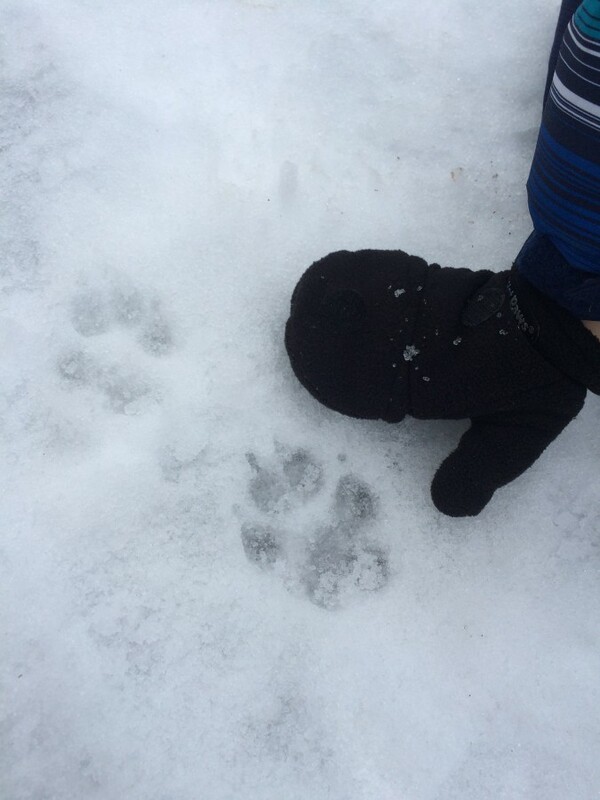 Because we had so much snow/ice at the beginning of the month, we were able to investigate many different animal (and human) tracks in our area. It became a major theme, with track identification, tracking of animals, and even track creation taking our curiosity to many places. 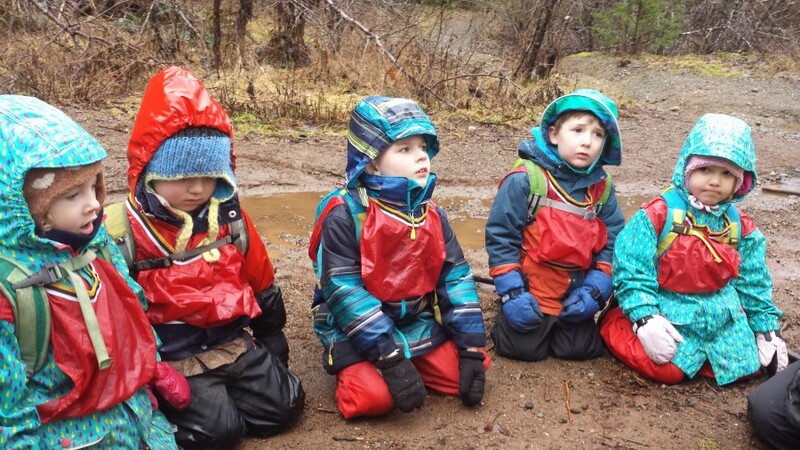 We started to explore making tracks of our own – through stamping with ink, in play dough, and even with paint on the bottom of our own boots! Clearly, we needed more resources! 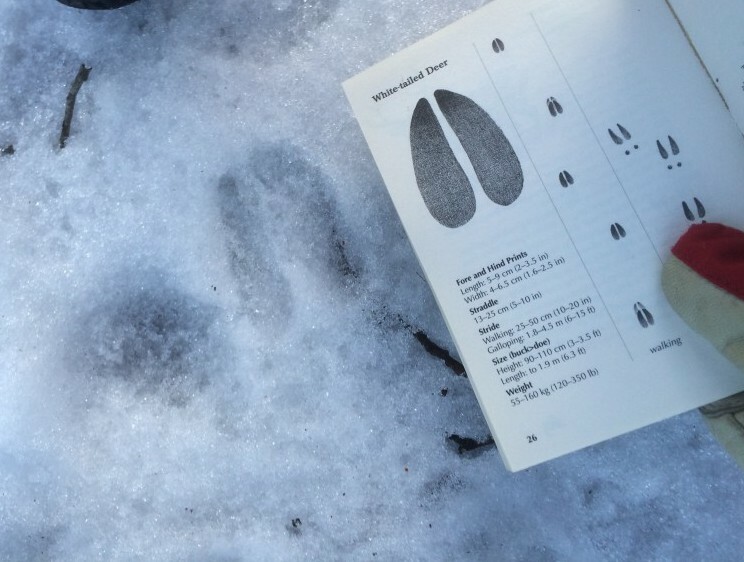 Identification books were used to help discover which of our guesses were right about who left the tracks behind. 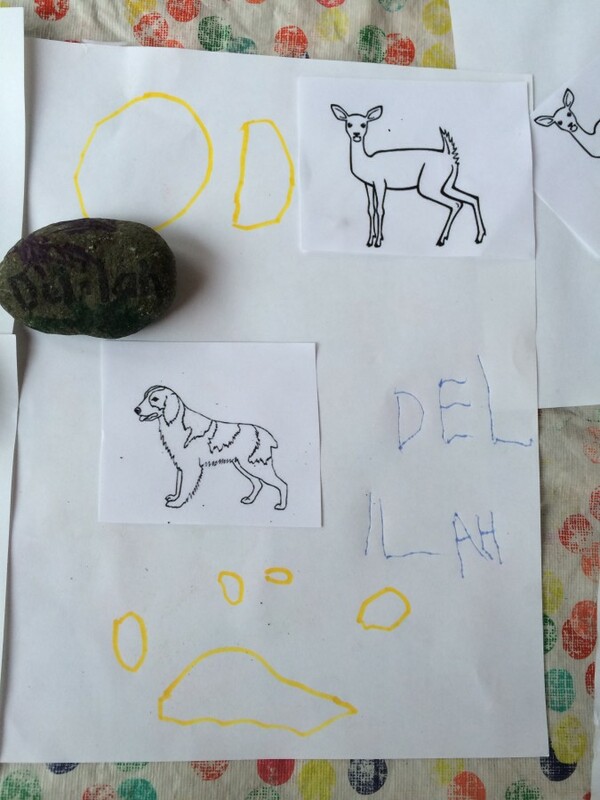 A matching activity evolved into a drawing exercise, where the children reproduced the print, and then matched up the animal the print belongs to. 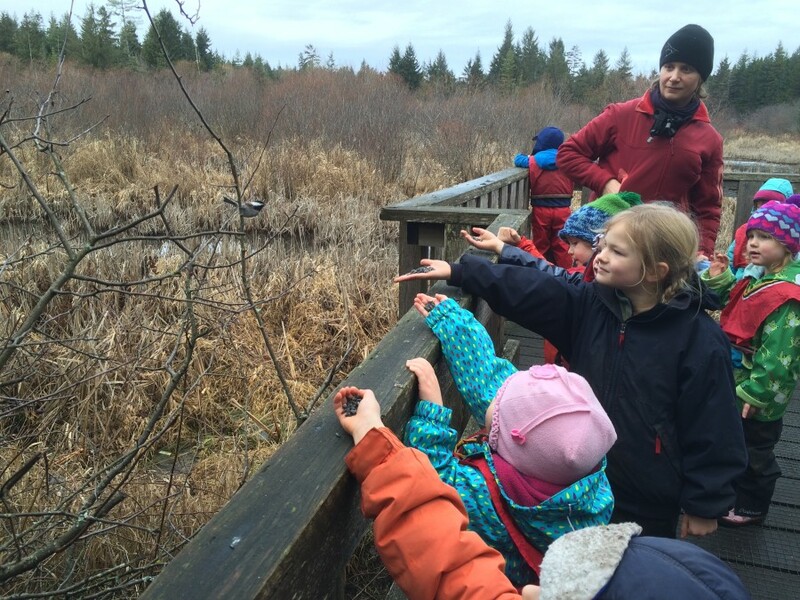 We went on the first field trip of the year this month – to the very special Lazo Marsh in Comox. What makes it so special is that the chickadees are willing to eat right out of humans’ hands! We extended our field trip experience by talking about birds, and investigating what makes birds different from other animals. 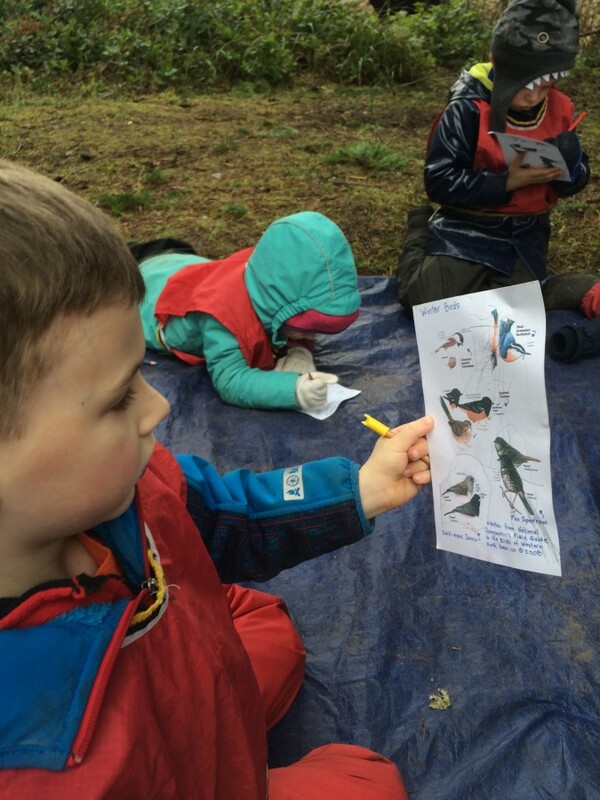 We brought along a simple bird identification card so the class could keep track of which birds they saw. 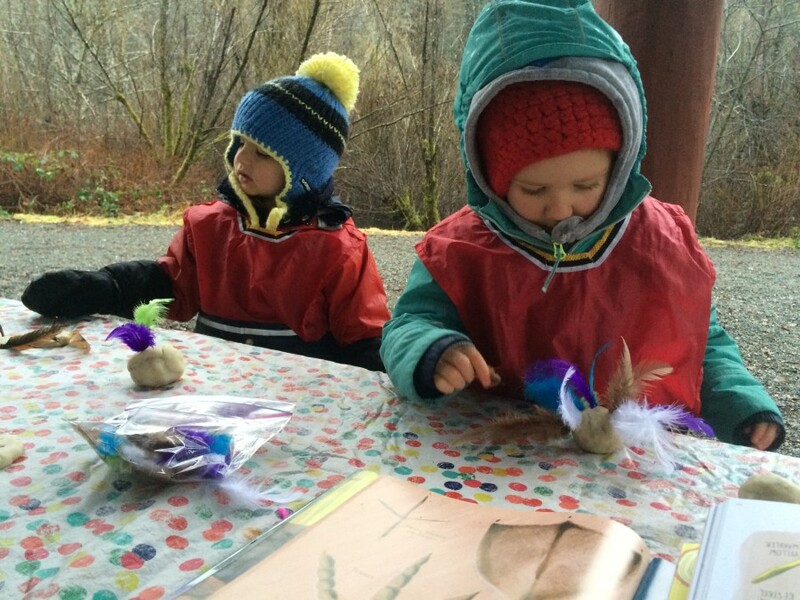 James brought along homemade bird cookies so our feathered friends could have a snack while we were enjoying ours. 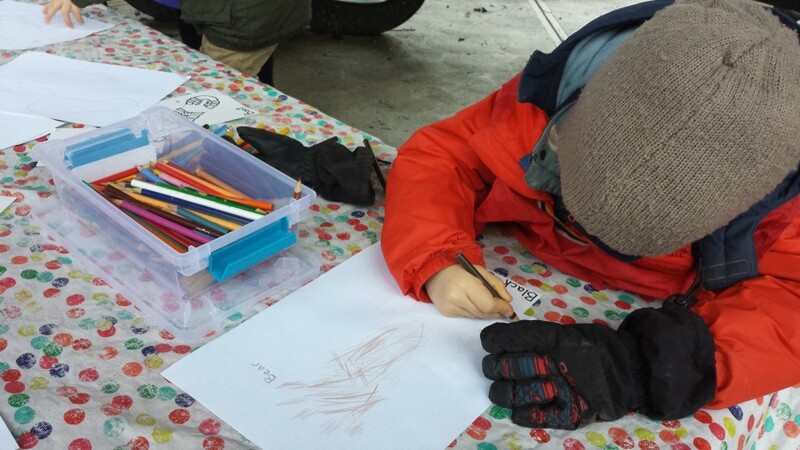 We also tried our hand at drawing feathers, as well as did a journal entry about what we know about birds. As we have settled back into our normal routine, we have also seen a lot of teamwork, especially when it comes to water play for some reason! The buckets of water were hauled up and then poured onto the bridge deck, to help melt the ice that made one end of it so slippery. Not only was hauling the heavy buckets hand over hand a tricky skill to master, getting it through the railing was an exercise in balance as well. Nolan initiated this project by piling a few rocks together. One by one the other children joined him until almost the whole group was involved in making this rock collection into a house. 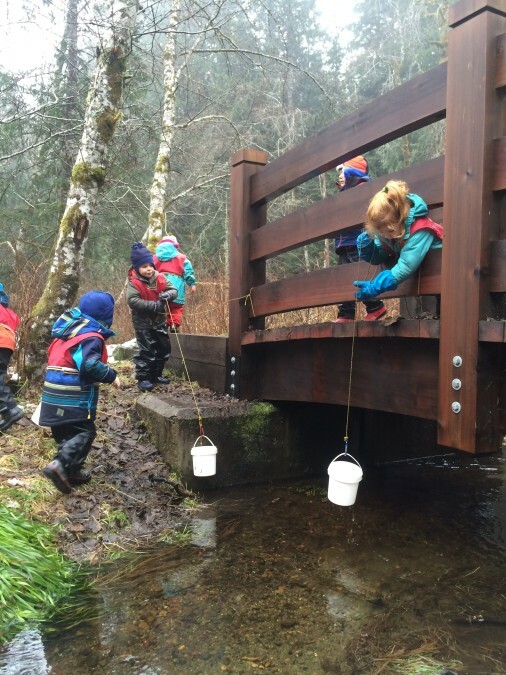 This small dam started out as a solo project by Juniper, but quickly became a group effort as water was shipped in to test the dam, and then someone noticed a bug who would not be able to swim across such a river, which led to the bug bridge being built. When we arrived at this site, the river was not flowing much at all, but with the whole groups working together, soon the creek was running again. Dawson ended up doing the final link where the creek leaves our “classroom”, and everybody was very excited about the success of their shared work! 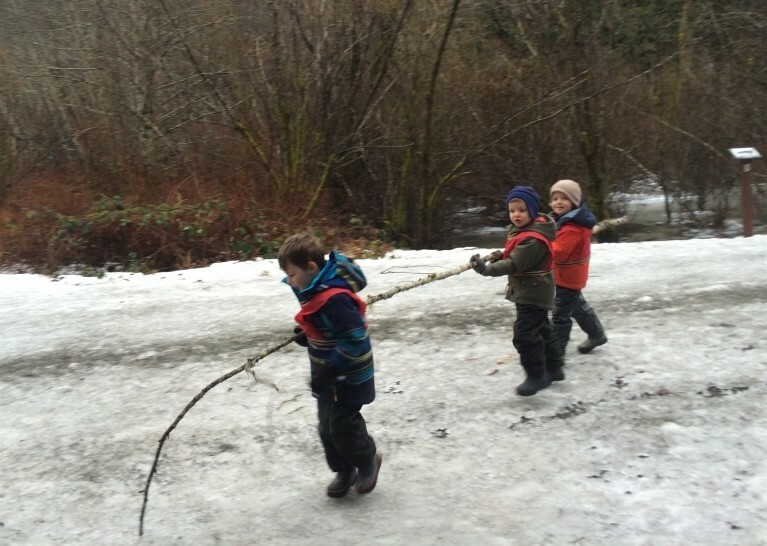 Friends are discovering that working together can result in great things!